Emma Young is the poet laureate of West Tisbury. Emma Young writes earthy poems. Her lines are pressed with the world we know — a tulip bulb, a shoulder blade, grapefruits, wind, waves, sesame seeds on an oiled pan — and her images seep up, like blood through a cloth, or seep through, like light in a fog. “The hay bales are inviting sleep./ Why not stay here, they husk.” Like May Sarton, Mary Oliver, and Basho, Young’s poems are exclamatory, candid, thrilled, intoxicated by this world, and deeply wise. 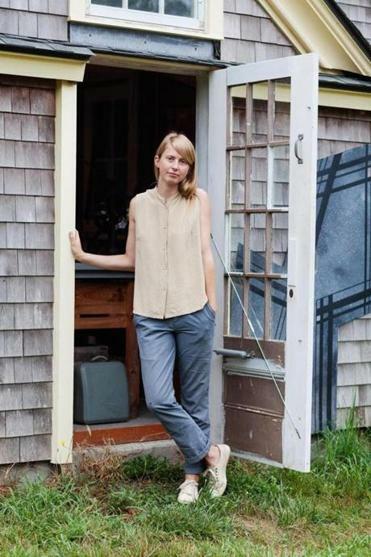 “When you are hot,/remember what it feels like/when you are laughing/and out in the cold.” Young, who is also a designer and printmaker, is poet laureate of West Tisbury on her native Martha’s Vineyard; she’s the youngest poet, at 30, to occupy the role. Her sensual new poetry collection, “Book To Share,’’ just released by Portland, Oregon’s Two Plum Press, gathers work she’s done over the past decade and reveals a voice of penetrating grace.